I can’t believe 2016 is quickly coming to an end! But that just means we can all get ready for 2017 by planning a fabulous New Year’s Eve party, right? The best thing about New Year Eve is getting dressed up, drinking champagne, and dancing the night away with friends and family. It’s a great time to start fresh, reevaluate any goals you may have, and make your new year’s resolutions. 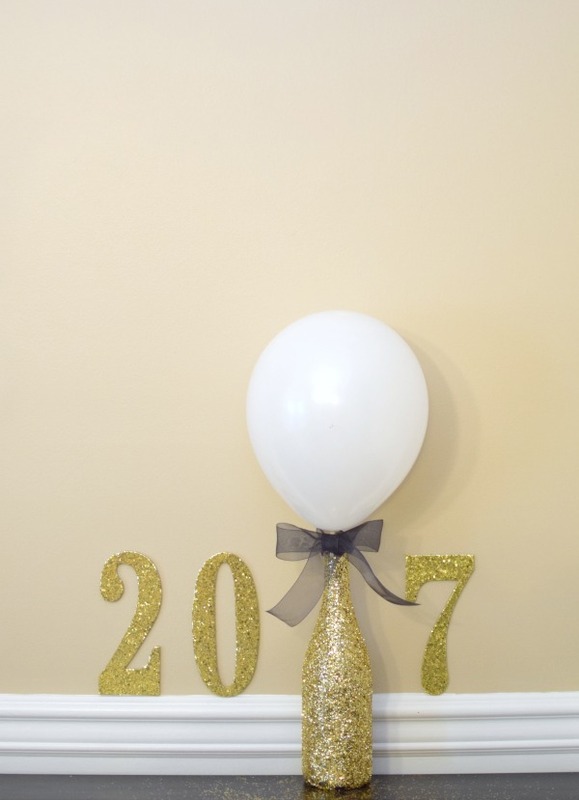 If you’re planning a fabulous New Year’s Eve party, this fun and simple DIY decor idea will make the perfect centerpiece or backdrop at your stylish soiree! A party, especially a New Year’s Eve party, just wouldn’t be the same without balloons, right? Balloons are a simple and fun way to make any celebration fun – and with the convenience of Balloon Time Helium Tank you can create the fun anytime and anywhere! 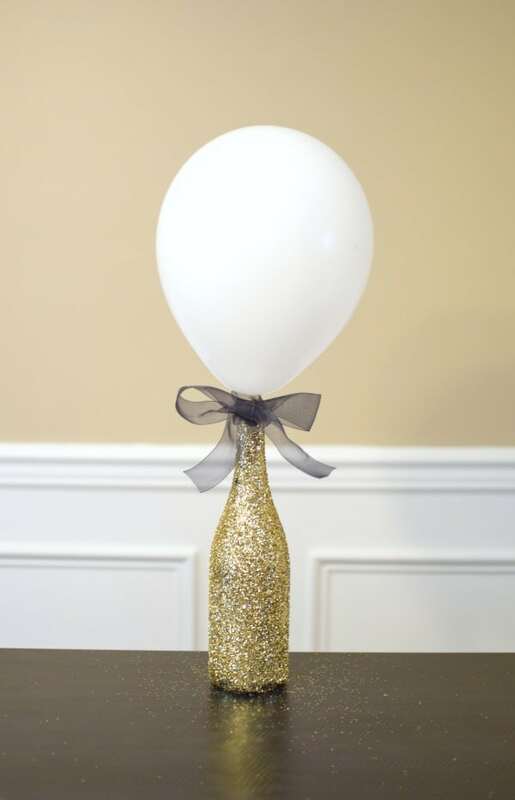 Add a little glitter and you have a fab DIY Glitter Bottle Balloon Centerpiece for NYE! First, set out some newspaper because this is going to get messy! But what’s NYE without a little glitter, right?! Take an empty wine bottle and soak it in warm, soapy water for 30 minutes to get the labels off. 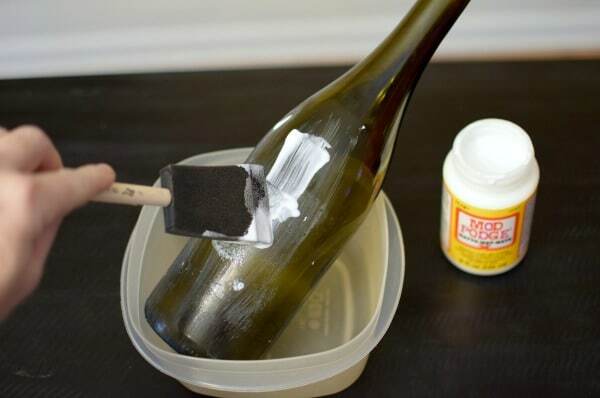 Once you get your labels off, brush a generous amount of Mod Podge all over the bottle with a foam brush. 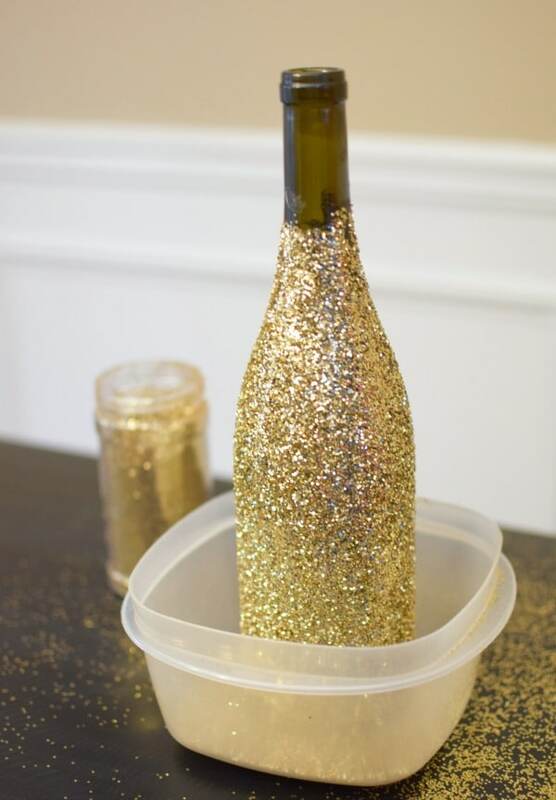 Then take your gold glitter and cover your entire wine bottle. 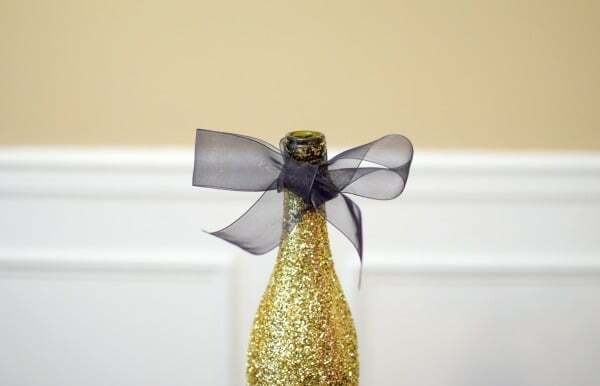 Shake the excess glitter off the bottle then add some more Mod Podge and glitter until your bottle is completely covered. Let your bottle dry completely. Add your black mesh ribbon around the neck of the bottle by making a pretty bow. Blow up a balloon using your Balloon Time Helium Tank. Then, attach the balloon to the top by taping it into the mouth of the bottle. 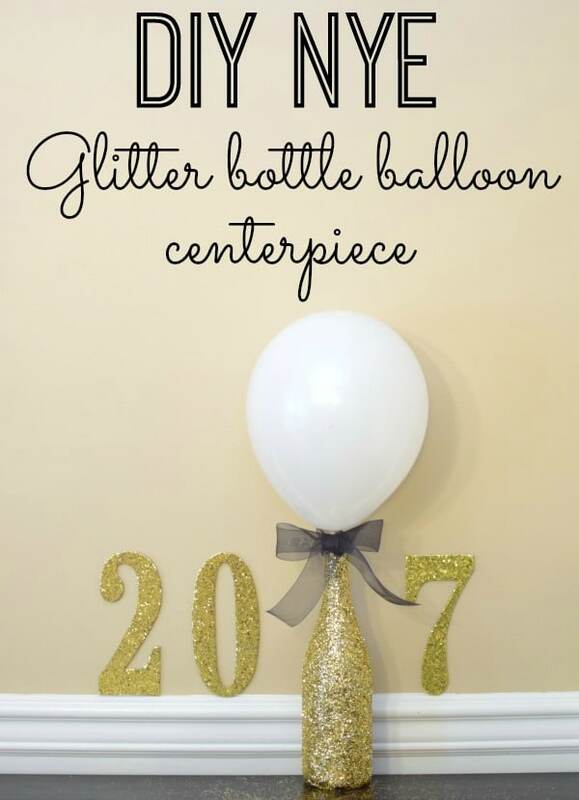 Set out your gorgeous DIY Glitter Bottle Balloon Centerpiece on individual tables as a centerpiece or add it as part of your drink or dessert table! I incorporated these fun gold glitter numbers with the bottle acting as the 1 in 2017! How fun is that idea?! 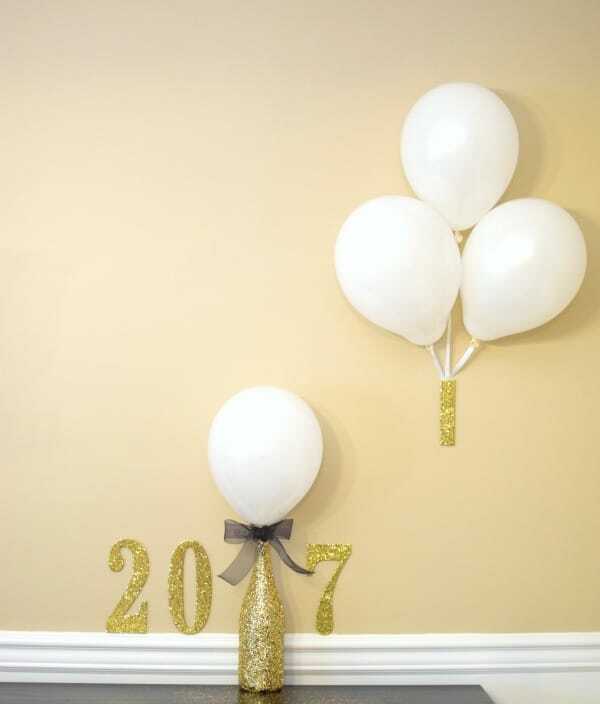 And because you will some helium left in your Balloon Time Helium Tank, you can blow up more balloons and create a fun balloon drop from the ceiling for that toast at midnight or a balloon photo booth backdrop for awesome NYE photos with friends! The possibilities for New Year’s Eve celebrations are truly endless. It’s all about how creative you want to get! 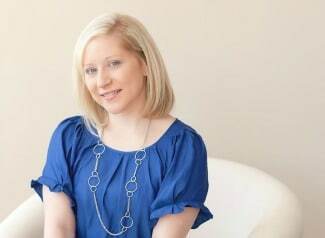 Check out more awesome DIY projects, tips, tricks and ideas at BalloonTime.com. 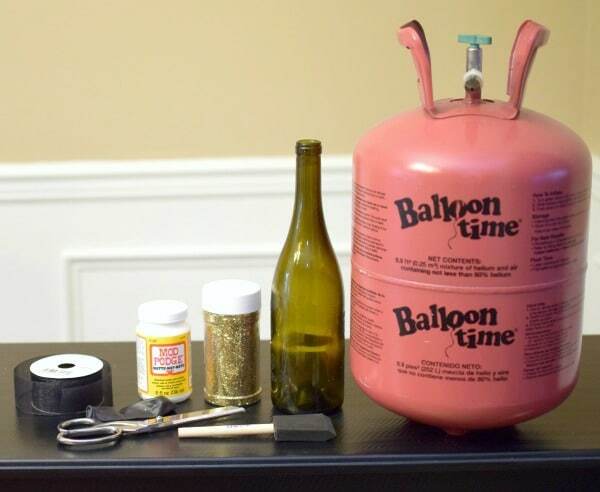 For more information on how to properly use the Balloon Time Helium Tank, fill balloons and more, visit Balloon Time. Happy New Year!